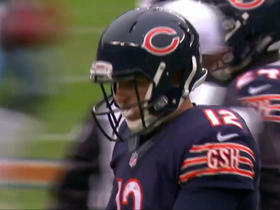 Braunecker signed a two-year contract with the Bears on Monday, Jason La Canfora of CBS Sports reports. Analysis: Braunecker has earned his keep as a special teams player and blocker over his three years with the Bears, but he's logged just seven receptions for 83 yards across that stretch. 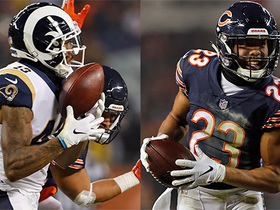 The 25-year-old will play a depth role behind Trey Burton (groin) and Adam Shaheen in 2019. Braunecker finished the 2018 season with five receptions for 42 yards as the Bears' third-string tight end. 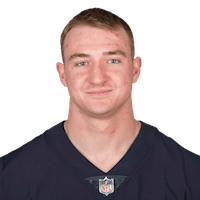 Analysis: Braunecker has posted just 83 yards over his three years with the Bears, and he has yet to emerge as a fantasy option. He'll be a restricted free agent this offseason, but unless he moves into a situation that allows him to be a full-time player, he won't be a fantasy option in 2019. Braunecker caught one pass for 20 yards in Chicago's 34-22 win over the Lions on Sunday. Analysis: With Dion Sims missing this game due to a concussion, Braunecker took over the primary blocking tight end role for the Bears and caught his only target of the afternoon. It's unlikely he'll be a consistent fantasy factor, because Chicago rarely throws the ball to its tight ends not named Trey Burton. Braunecker (concussion) was a full participant in Wednesday's practice. Analysis: Braunecker sat out Chicago's win over the Bills in Week 9 due to a concussion, but appears on track to clear the league's concussion protocol and suit up against the Lions on Sunday. If Braunecker is good to go, expect him to receive most of his snaps on special teams. Braunecker (concussion) will not play Sunday against the Bills. Analysis: Braunecker sustained the concussion last week against the Jets. It appears the 24-year-old didn't clear the league-manadated protocol for head injuries. Braunecker gets most of his snaps on special teams, and his absence is therefore unlikely to yield a significant amount of offensive work to another player. 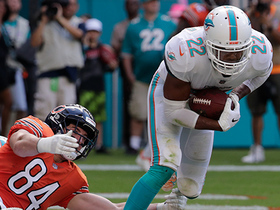 Miami Dolphins safety T.J. McDonald makes a clutch interception off of QB Mitchell Trubisky in the end zone. Chicago Bears quarterback Matt Barkley throws an interception to Tennessee Titans linebacker Wesley Woodyard.